BINGHAM — Nick Rogers paced in the Valley School gymnasium. In a few minutes, Rogers would give a presentation to all the students in the Bingham school. He’d already been down the hill at Quimby Elementary. Rogers was wearing shorts, putting his prosthetic legs in full view. The words “Never Say Never” were written on the back of Rogers’ legs, like tattoos where his calves would be. Years ago, when Rogers was running around Bingham as a child, he was self conscious about his prosthetics. 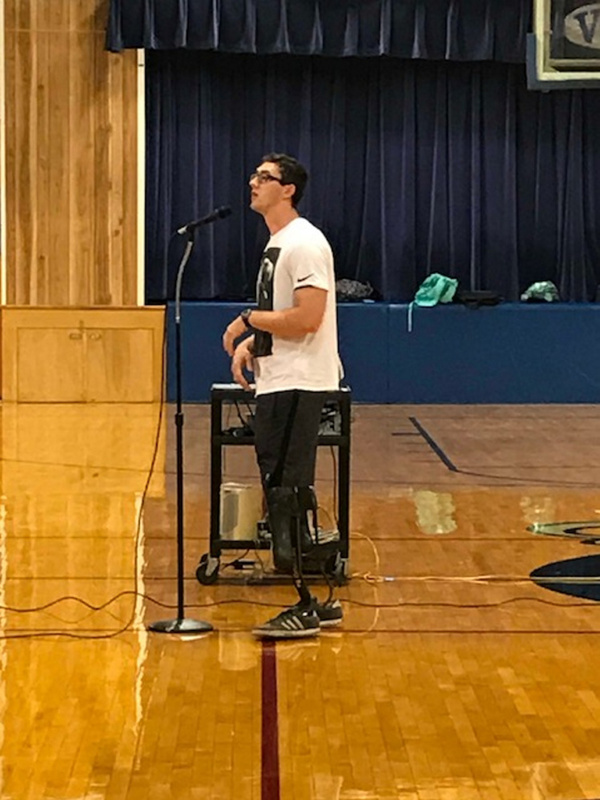 Now, 21 and one of the top Paralympic sprinters in the country, Rogers wanted every student coming to the assembly to get a long look at the legs. On Friday, Rogers told his story to students in his hometown school. He told them about competing in the Paralympics in Rio last year, in the World Championships in London this past summer. He told them about successes on the track, and failures. He told them about working hard, no matter what obstacles the world throws in front of you. He showed a video of his 400 meter race at the World Championships, where fighting a knee injury, Rogers placed last in his heat. “I lost! I was dead last. But you know what? I was happy to cross that finish line,” Rogers said. The assembly moved outside, to the soccer field, where Rogers put on his racing legs and sprinted a race against Valley senior Lexi Davis, and teachers Maria Cirelli and Wendy Spencer. He won without breaking a sweat. Afterwards, when all the students were back in class, Rogers was pleased with how the event turned out. He has a lot of people to thank, a lot of people who helped him get from Bingham to Chula Vista, California, where he now lives and trains. Speaking at Valley was just an early step in what he expects will be a lifelong thank you tour. Rogers was born without a fully formed fibula on both legs. He grew up on prosthetics. Rogers was active, but he was self conscious, too, more often than not wearing pants to disguise his impairment. The illusion worked. A day after seeing 14-year old Rogers run around like a fool, doing cartwheels and an obstacle course at Camp No Limits in Rome, in pants, hiding his legs, people from the Never Say Never saw Rogers in shorts. Never Say Never was founded to help coach and encourage disabled athletes, and in Rogers, they saw a world class sprinter. Rogers left Bingham to live with his grandmother, Linda Rogers, and attend Lisbon High School, where he graduated in 2015. Rogers needed a stable environment, he said. When he added running to that mix, he found stability and then some. “When I moved out of here, I was just trying to graduate high school,” he said. Rogers thinks about Bingham a lot, particularity of his younger brother Derek, a second grader, and sister Jada, a freshman at Valley. “I think about my little brother and sister, and the impact I have on their lives. It’s actually what I do before I run, to be able to mellow myself out. I think of all the people, all the stuff that has helped me. It’s my way of giving thanks before I run in front of 70,000 people,” he said. Public speaking, being a role model, is just a piece of Rogers’ overall plan. He’s still an ambassador for Never Say Never, hence the branding on his everyday legs. He’s worked with Wounded Warriors, helping soldiers who lost limbs. He recently started taking courses at Southwestern Community College. The school is near the elite training center outside San Diego at which he trains with other Team USA members. 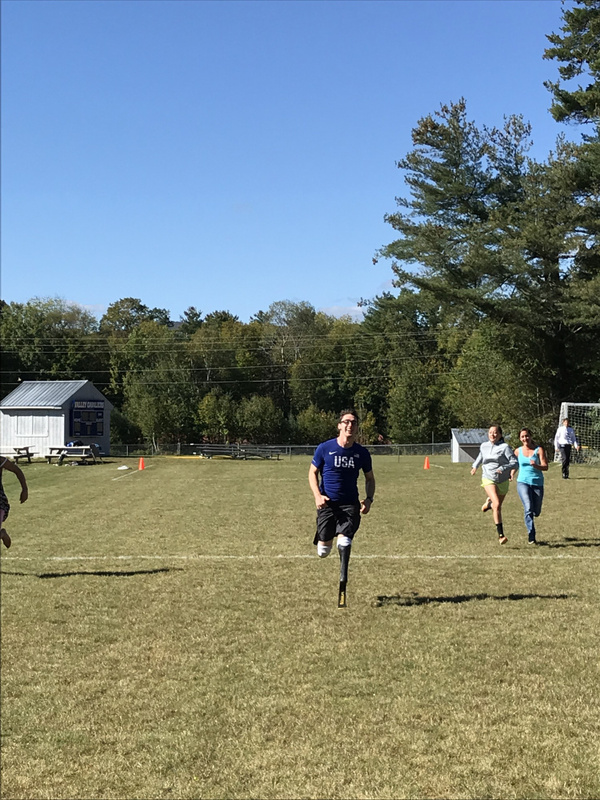 He’s working to find a track and field scholarship at a Division I school, where he can run and study a science-based major, biology, biomechanics, something that will forward his ultimate goal of making prosthetics. With prosthetics costing thousands of dollars, Rogers wants to work making them, so more people can take part in more activities. “I’m a believer in, nobody does anything by themselves. We all have a support system,” Rogers said. Rogers smiled when he thought of the first time he put on a pair of racing legs and just let his body go. If he can give that feeling to other people, it will be bigger than racing against the world’s best. Rogers knows he’s been given a chance. Not just for personal success. When he thinks of that first time really running, he wants to share it with as many people as possible.